The goal of thermotherapy is to alter tissue temperature in a targeted region over time for the purpose of inducing a desired biological response. The majority of thermotherapies are designed to deliver the thermal therapy to a target tissue volume with minimal impact on intervening or surrounding tissues. Heat: By increasing the temperature of the skin/soft tissue, the blood flow increases by vasodilatation. The metabolic rate and the tissue extensibility will also increase. Heat increases oxygen uptake and accelerates tissue healing, it also increases the activity of destructive enzymes, such as collagenase, and increases the catabolic rate. Cold: By decreasing the temperature of the skin/soft tissue, the blood flow decreases by vasoconstriction. It will be followed afterwards by a vasodilatation which will prevent against hypoxic damage (hunting reflex: If the cold pack is left on the skin for more than 10 minutes, the blood vessels will dilatate). The tissue metabolism will decrease just like the neuronal excitability, inflammation, conduction rate and tissue extensibility. At joint temperatures of 30°C or lower, the activity of cartilagedegrading enzymes, including collagenase, elastase, hyaluronidase, and protease, is inhibited. the decreased metabolic rate limits further injury and aids the tissue in surviving the cellular hypoxia that occurs after injury. Heat: Heating of superficial tissues can be achieved using hot packs, wax baths, towels, sunlight, saunas, heat wraps, steam baths/rooms. We can also get the heat in the deeper tissues through electrotherapy (ultrasound, shockwave and infrared radiation). Skin blood flow is controlled by two branches of the sympathetic nervous system: a noradrenergic vasoconstrictor system and a cholinergic active vasodilator system. These dual sympathetic neural control mechanisms affect the major aspects of thermoregulatory responses over most of the human body’s surface. 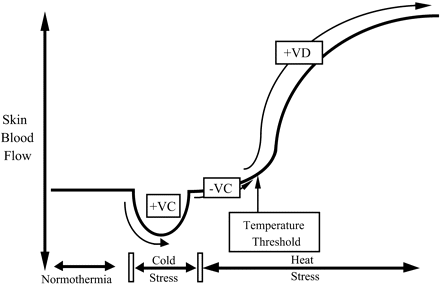 During periods of hypothermia, falling core and skin temperatures lead to reflexive increases in sympathetic active vasoconstrictor nerve activity to reduce skin blood flow and conserve body heat. During periods of heat stress, increasing core and skin temperatures lead to reflexive increases in sympathetic active vasodilator nerve activity to increase skin blood flow. The effect of heat on pain is mediated by heat sensitive calcium channels. These channels respond to heat by increasing intracellular calcium. This generates action potentials that increases stimulation of sensory nerves and causes the feeling of heat in the brain. These channels are part of a family of receptors called TRPV receptors. TRPV1 and TRPV2 channels are sensitive to noxious heat, while TRPV4 channels are sensitive to normal physiological heat. Their multiple binding sites allow a number of factors to activate these channels. Once activated, they can also inhibit the activity of purine pain receptors. These receptors, called P2X2 and P2Y2 receptors, are mediated pain receptors and are located in the peripheral small nerve endings. For example, with peripheral pain, heat can directly inhibit pain. However, when pain is originating from deep tissue, heat stimulates peripheral pain receptors which can alter what has been termed gating in the spinal cord and reduce deep pain. The treatment depends on the type of application and the type of disease. The first phase, known as the inflammatory phase, protects the injured area from further injury while the body contains the damaged tissue. During this phase, cryotherapy can help to reduce swelling. Never use heat during this phase because heat increases the blood flow into the injured area and increases the amount of swelling. The inflammatory phase has a duration of 2 days. During the second phase, the proliferation phase, new tissue and scar tissue are formed. Heat can now be applied to the injured area to facilitate the healing process. There are still a lot of contradictions if the use of thermotherapy is effective; however, worldwide it is used to reduce the pain. While there is good evidence that exercise relieves pain, improves function, and is cost-effective, evidence supporting the use of non-exercise physiotherapeutic interventions is much weaker. There is some support for the efficacy of thermotherapy, transcutaneous electrical neuromuscular stimulation (TENS), and massage. But there is little evidence to support the efficacy of electrotherapy, acupuncture or manual therapy. For knee osteoarthritis (OA), ice massage is reported to improve joint movement, pain and function; ice packs can reduce swelling and improve movement but may not relieve pain. In rheumatoid arthritis (RA), heat or cold packs are reported to have no effect on edema, pain, movement, strength or function. Despite conﬂicting evidence, the simple form of thermotherapy is widely recommended for many musculoskeletal conditions because it is a safe, effective, easy-to-apply and well-liked therapy based on anecdotal reports, expert opinion and patient preferences. 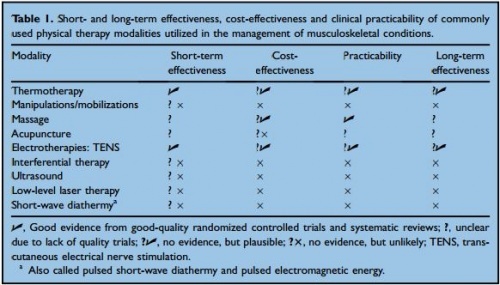 Interventions that can be self-administered (thermotherapy, TENS, massage) are more likely to be cost-effective and less burdensome and hence much more attractive long-term management options. Complex thermal therapeutic modalities (heating deeper tissues) require special equipment, supervision and need to be delivered by a therapist, making them less accessible, more costly and higher risk. ↑ 1.0 1.1 1.2 1.3 1.4 1.5 1.6 M. V. Hurley et al., Non-exercise physical therapies for musculoskeletal conditions, Best Practice & Research, Clinical Rheumatology, 2008. ↑ Hendee W.R., Physics of Thermal Therapy, Fundamentals and Clinical applications, By Taylor and Francis group, 2013. ↑ 7.0 7.1 Heinrichs K., Textbook of medical physiology, Philadelphia, 1986. (chapter 16: superficial thermal modalities). ↑ 18.0 18.1 Fahey T.D., Athletic training: principles and practice, Mayfield.